As the largest university in Greater Baltimore, Towson University is committed to leading as an anchor institution to create positive impacts in the communities we serve. In 2017, Towson University became the only non-city institution to join the Baltimore Integration Partnership (BIP), a collaborative partnership of anchor institutions, funders, nonprofits, and public organizations focused on establishing economic inclusion as the business culture of norm in Greater Baltimore. One of the goals of BIP is to remove barriers to access and training for increased hiring of local and minority residents by anchor institutions and anchor supporting businesses. One program that TU has been greatly involved in is the Administrative Assistant Training Program through Humanim. This is an in-depth 10-week course that allows participants—most are African Americans from economically distressed neighborhoods—to graduate with a PACE (Professional Administrative Certificate of Excellence) certificate. The PACE certification establishes credentials and instills a sense of pride in the program participants. And, it allows them to move into jobs making a living wage. Through this program, participants receive training and certification for job placements in 10 weeks. They go on to be placed in positions with anchor institutions, including Towson University, in positions including executive/administrative assistant, office clerk, and office assistant. Working at Towson University, my goal is to change lives. The graduates of this program look to Towson University for opportunity, and whether it is temporary or permanent, we can provide a home where they can learn, develop, and grow to further their careers. In 2015, Towson University conducted an analysis of applicant data and found low percentages of qualified, diverse applicants. Our data showed that we were not attracting a diverse group of quality applicants. In addition, our passive recruiting (just posting jobs to different job boards) was not successful. We realized as an institution that we needed to do more outreach and develop stronger partnerships to reach the qualified applicants in Greater Baltimore that had not previously considered Towson University as an employer of choice. I was connected to Kurt Sommer, Director of BIP, and he invited me to join other anchor institutions in addressing local hiring. At one of the first presentations, Humanim, a Baltimore-based nonprofit that supports and empowers individuals faced with social or economic challenges, spoke about the Administrative Assistant Training Program that was currently in development. I immediately knew that Towson University needed to be involved. The Administrative Assistant Training Program was initiated in April 2015 in response to the civil unrest that happened following the death of Freddie Gray. Baltimore was one of seven cities selected nationally to receive a two-year grant award—One Baltimore for Jobs (1B4J)—in partnership with the Baltimore City Mayor’s Office of Employment Development and Maryland’s Department of Labor, Licensing, and Regulation (DLLR). “The grant was designed to engage youth similar in age to Freddie Gray (18–25) who lived in distressed neighborhoods and had limited access to career training and employment. It also mandated that employer partners were identified who would agree to hire participants after graduating from training,” said Kanika Feaster, Vice President of Workforce Development at Humanim, who manages the Administrative Assistant Training Program. 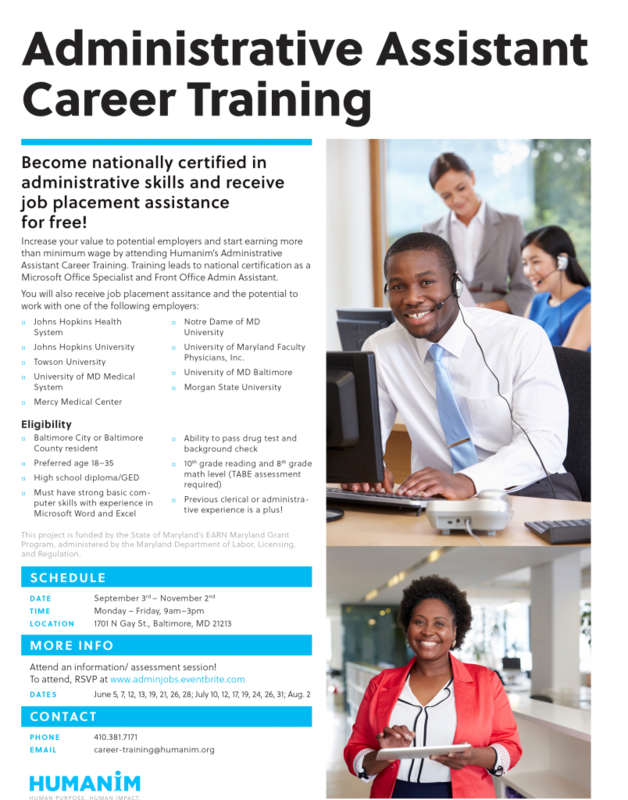 Additionally, trainings had to be in career growing industries and had to offer participants industry-related certifications. Upon completion, participants had to be placed in a full time position making at least $11/hour. The training is offered at no cost to the participants. Due to the success of Humanim’s program pilot with 1B4J, Humanim was able to continue the admin program through DLLR’s EARN Maryland grant funding, which invests in strategic industry partnerships whose goal is to develop plans to train and educate workers—and place them in meaningful employment. “This program allowed BIP to engage anchors about the type of entry-level jobs they had the most need to fill with low skilled workers and that offered opportunities for advanced training and career growth. Administrative Assistant was the identified occupation, and our program was born,” said Feaster. 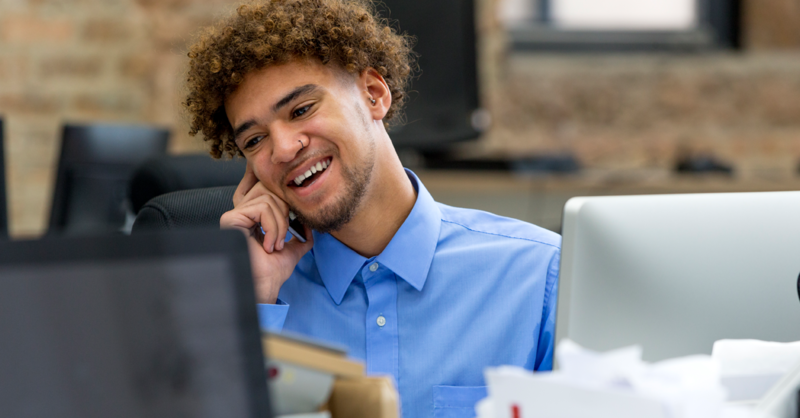 The goals of the Administrative Assistant Training Program are simple: to deliver occupational skills training in the administrative field, targeting economically distressed communities across Baltimore City for candidate recruitment. To meet the outcomes for the EARN Maryland grant, 30 participants must be enrolled over two cohorts. From that, 75% (22) must complete with a certification, and of those who complete, 80% (17) must be placed into a full time job related to the industry trained in, making at least $11/hour. Recruiting and training efforts began in early 2016, with initial 1B4J funding covering three cohorts of 15 individuals each. Two cohorts received PACE certification and one received a medical administration certification. All cohorts received Microsoft Office Specialist certification. In addition to the certification, participants gain valuable advanced soft skills and professional development training, as well as case management, job placement, and retention support. Together, BIP and Humanim worked with us and the other participating anchor institutions to hold us accountable to the program and the commitment to hire participants. They worked to build relationships with each anchor to identify job opportunities, to promote the program with our HR teams and hiring managers, and to assist with meeting placement goals. “Institutions are recognizing that they must alter policies and practice to engage with workforce partners who can successfully prepare individuals for jobs in their institutions. The program also helps demonstrate that the institutions can play an assertive role and make direct impact to support the employment needs of area residents,” said Sommer. Although the initial year of the program went well, there were many lessons learned as part of the startup. Towson University developed the idea of creating a temp pool, which has been very successful for program graduates. In the short-term, we are able to fill critical needs quickly with quality candidates. The goal of the temp pool is to provide administrative support on short notice when there is a short or long-term vacancy. We place Humanim graduates through the Contingent I appointment. However, we encourage them to apply for permanent positions and other opportunities while they learn on the job. TU also supports Humanim by participating in job shadowing, mock interviews, and serving as a panel moderator for a panel on meds vs. eds (comparing medical institutions to education). We also bring the cohorts to TU’s campus for a morning of meeting managers, touring the campus, and learning about working at TU. Humanim staff has organized a steering committee of the human resource leaders of the participating anchor institutions. “The steering committee has helped to refine the curriculum, identify job descriptions, and support candidates’ efforts to identify and apply for jobs in the institutions. Humanim staff has been able to reach additional institutions and employers for placements that are not part of the BIP infrastructure,” said Sommer. Through this partnership, Humanim has challenged Towson University (and all participating anchors) to look at hiring practices, by reviewing administrative entry-level positions, and re-evaluating skills that are labeled “entry level” but are really more advanced. In working with other anchors and their HR teams, we can determine how to best evolve to accommodate more diverse and inclusive hiring practices, in support of the “local hiring” goals we have committed to. It is hard to describe in words how much BIP and the program has meant to the 32 training participants who have been placed into an administrative assistant position at one of the anchor institutions. In combining EARN Maryland and 1B4J grant outcomes, Humanim has enrolled 75 participants. 64 completed the program with a certification(s). 54 graduates have been placed into employment, with 32 of those placements at an anchor institution. I am thankful for TU’s partnership with Humanim and BIP. We have grown a lot together. Together we are changing the lives and experiences at TU. They do so much of the heavy lifting, while we get to enjoy the benefits of a strong employee. 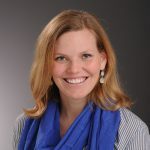 Jennifer Stano, PHR, SHRM-CP, is the Employment, Classification, and Compensation Manager in the Office of Human Resources at Towson University. Jennifer’s experience in Human Resources includes serving as an Educational Program Manager for a restaurant seafood chain, followed by working as a Human Resources Generalist in the defense industry. Her current focus is on enhancing the employment experience, utilizing technology and automation to improve customer service, and expanding outreach to the Towson communities to form new partnerships and attract a diverse set of qualified applicants.